1) Needs no additonal software installed. 2) No pop up windows to select settings. Specify it in code. 3) Can capture from multiple capture devices at the same time. 4) Supports wide number of video capture devices. DISCLAIMER - This software is experimental, use at your own risk. send me fixes, improvements etc - email is in the header file. Lots of new stuff! If there are no major issues with this release it will become the 0.2 release. - set framerate - VI will try and set the framerate of your device as close as possible to what you request. - adjust video setting properties (like shutter speed, pan, zoom, whitebalance etc) in code. - new device listing code - should give better results. - getDeviceName for returning the name of the device as a c string. Thanks Peter! - ability to reconnect to device if camera freeze is detected. - some non freed memory issues. - a bug with closest device matching. - a potential bug from not setting the lSampleSize of the media type. Thanks Peter! - restartDevice remembers all your settings now. Fixes a bug with 0.199 which can cause a crash when trying to load a camera. Lots of memory allocation / deallocation fixes. Threaded settings window - so you can adjust the parameters and see the results. Hopefuly a good deal more stable. This version has been in private testing and results have been very good so far. If you have usb capture devices that stop capturing after a while - see the notes included in the download on how to disable Windows power saving on your USB ports. This was found to be the cause for a lot of devices freezing after a certain amount of time. There have been some issues with certain capture cards freezing with previous releases. This release corrects those issues but with the same functionality as 0.198. If you have downloaded 0.198 please replace with this release! Callback method can be set before capture begins. Better device shut down handling. Don't download this release - get 0.199. Callback method can be set in the header file. Fixes where on a few capture cards video would stop coming after a period of time. Minor patch to 0.194 - fixes a naming conflict between openCV (cvaux) and videoInput. There was a couple of huge bugs in 0.191 so this release is maninly to fix them. The first bug was to do with a lack of mutexs for the grabbing thread that would result in the capture stopping after a while. The second bug was to do with not finding the correct closest or exact size with some capture cards. Visual Studio Demo Project pimped! - now with openGL textures etc. Thanks to Martin C. Martin for the threading fix and other improvements! -Much much cleaner - trust me you want to use this one! This release has been tested with Visual Studio 2005 express - but it should work fine with the full version too! You need to have the windows SDK installed - which is pretty normal. Please read the visual studio notes! It will make life easier. To get the windows sdk working in VS 2005 express - you have to jump through these hoops! The CW demo app included is a simple openGL app that creates a window and grabs video from a capture device to a texture. Use the CW demo app to check if you camera is connecting okay. First release with Visual C++ demo App!!! You need to have the windows SDK installed - which is pretty normal. To get the windows sdk working in VS 2005 express - you have to jump through these hoops! The demo app included is a simple openGL app that creates a window and grabs video from a capture device to a texture. The Visual Studio demo app is pretty much identicle to the Code Warrior apps that older release of videoInput have come with. Read the notes for release 0.17 for class useage. Thanks to Phillip and Jared of Potion Design ( www.potiondesign.com ) for visual studio help and Dynal Patel, for remote debugging and impetus to do the whole VS thing! Micro release! Use this version instead of previous versions. 0.18 Coming soon!!! The other versions prob aren't visual studio friendly. Thanks to Phillip and Jared of Potion Design ( www.potiondesign.com ) for figuring out some bugs that prevented proper use in Visual Studio. -Nicer implementation - now you can capture from devices 1 and 2 without having to capture from device 0.
at upto 1280 by 1024 . See the notes of previous releases for other features. Contact me at : theo [DOT] watson (AT) gmail [DOT] com . See the notes of release 0.16 bellow for code useage. -Added YUV formats!! - this means that you have a much larger choice of capture sizes. -Only need one instance of videoInput to handle all the cameras you need. -Added Driver dialog to change properties of capture device. -Grabs RGB by default thanks to some nifty assembly code. See the notes of release 0.155 bellow for code useage. PLEASE LOOK AT THE EXAMPLES BELOW AND INCLUDED WITH SOURCE FOR PROPER USEAGE. VI  ->setup(1); //try to setup two cameras. VI  ->setup(2); //try to setup two cameras. non default capture size (needs to be a compatible resolution though). //if you are converting to grayscale as it saves frames. //that is it done! easy huh? Version 0.12 Supports USB web cams and also to select the non default physical interface (ie S-Video) from a capture device. Version 0.11 has a number of changes most importantly in the way devices are listed please re-read the h file for info. Here is an early working alpha release of videoInput which can capture from most installed capture devices on windows in a few lines of code. To use just include the lib and header file thats all you need. The header file has info on how to use it - it is very easy to use just a few lines of code. The image handed back is BGR not RGBA - it can return RGB too but if you are going to convert it to black and white anyway just use the regular grabFrame call. You have to supply a unsigned char * buffer to the grabFrame function that is the right size for your device. If your device captures at 320 by 240, you need to have a buffer[320*240*3] at least so it can store the whole image. 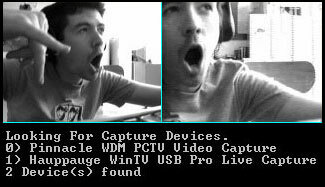 Tested on the Hauppauge WinTV Pro USB Capture card and the Pinnacle PCTV Card other cards probably work but I don't know for sure. Can handle multiple cameras as you can see above, needs a new instance of the class for each camera. This code is to make people's lives easier (hopefully) , I don't care how it is used. If you have bugs, questions, comments or improvements I would love to hear them.